Being a PhD student can sometimes feel a little isolating, although those of us based in the lab are lucky enough to have an built in community, that doesn’t mean we can’t also look outside of the lab, our departments and our institutions for people to talk to and discuss PhD life with. For humanities and non-campus based students I think this is even more important, being a genetics student I can’t give you specific examples but I have no doubts there will be communities out there for you and I would suggest beginning with the amazing group that’s sprung up around the MOOC “Surviving you PhD” (run by the amazing @thesiswhsiper) on Twitter. I have to admit I started the MOOC but definitely haven’t been devoting anywhere near as much time to it as I would like to. 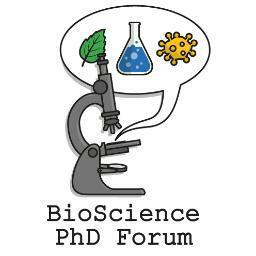 So along the theme of supportive communities I wanted to introduce you all to the Biosciences PhD forum who have recently launched their new blog. The forum originally launched as a twitter handle (@Biosci_PhD) and a place for Bioscience students to share their successes, failures and general experiences of life in the lab. The forum was founded by Stewart Baker and Devon Smith and has grown to include several other admins, all of whom can be found on twitter. I’ve been lucky enough to get to know Stewart and Devon over Twitter and their support for my personal blog has been amazing, so when they launched the blog I was more than happy to be a contributor 🙂 . I wrote a post that’s filed under the academia subheading and they very kindly gave me the freedom to write about any topic of my choice that would fit. I decided to write about the assumptions people often hold about PhD students, about how we often do all the things employees do, without ever actually being recognised as employees. This leaves us in a strange middle ground, I won’t repeat the entire post, but if you’d like to you can read it for yourself here. I’ll be contributing to the forum again so if you’re interested check back soon to see my next post. Whether or not you’d like to read my posts I’d urge you to check out the forum, and get in touch with them on twitter. It’s a great place to share your experiences and to realise that you’re most definitely not alone in the PhD journey. It was great reading this article. I came across many PhD communities through this blog. some of which I am following on twitter.I am running my own website related to PhD and soon going to start blogging related to PhD. Glad to know I am not alone in my Phd journey. I could write notes about it but I will just keep going. I will be subscribing to the forum for more posts.